Updated. 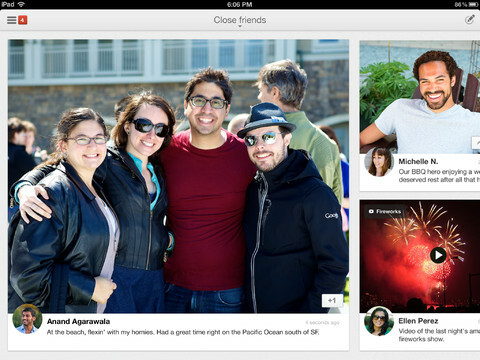 Google (s GOOG) just released a native Google+ app for the iPad, bringing Hangouts group video chats, the Google+ stream and other goodies to the Apple (s AAPL) tablet. Google also added a few new features to the iPhone version of the app, which includes Hangouts as well as limited support for Google+ Events. The new iPad app closely mimics the Android tablet experience, but with a few key differences: iPad users will be able to stream their Hangout group video chat sessions to their Apple TV via Airplay. Also, Google+ on iOS doesn’t support Party Mode for events yet, which makes it possible to automatically add photos to an event after a check-in. Google+ Events are also limited in other ways: iOS users basically can view events, but not create any events on their own, RSVP, comment or tag photos. A Google spokesperson told me that the Google+ team is working to make the Events experience consistent across both platforms. Update: Turns out that you can RSVP to events in the iOS app. With the release of the iPad app, Google went full circle with the deployment of mobile apps for Google+: It first unveiled a new and revamped Google+ mobile experience on the iPhone, then launched it on Android for both mobile phones and tablets, only to bring it to the iPad soon after.